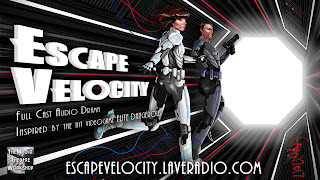 The Radio Theatre Workshop: Escape Velocity series 4 is in development! Escape Velocity series 4 is in development! Escape Velocity series 4 is in development! I'm currently working on the scripts that will become series 4 of Escape Velocity - where the story that has been gradually told over three seasons will finally come to a dramatic conclusion! Escape Velocity is funded by you, the listeners and fans. I really couldn't make it without you so if you love the podcast please consider becoming one of our wonderful Patrons over at Patreon.com. Unlike a one-off crowdfund site, Patreon allows you to support the show one episode at a time. It's a really great way of making this podcast and I am hugely grateful to all my supporters. Right now I'm planning additional content which will be exclusive to each episode's backers, so there isn't a better time than now to get involved in the series and keep up to date with development news as it happens!